With no shortage of classes, it’s tough to make an informed decision about which franchise might be the best for you and your wallet. There are literally dozens of exercise classes to attend, and your opinion may differ depending on your personality, your personal finances and your fitness goals. After all, certain workouts are tailored for specific training goals or muscle groups. WTOP has tested some of the popular local gym classes around the region to help you decide which ones may work for you, lift the curtain and lessen the intimidation factor. Check out some observations on popular classes around the region. We’ve also broken down where to find the classes, the cost to participate, details about intro rates and what you need to bring. This is the only gym class I’ve ever gone to where I’ve been brought to tears – not by pain and suffering, but by the way the instructor encouraged us to dedicate the workout to someone who couldn’t be there. This class happened to come on Mother’s Day, and while my mother is doing great, I couldn’t help but think of my aunt who died in early 2017. She would have been pleased to know I was up early sweating on a Sunday morning. The class is great for someone who knows what they want from a workout and how to get it without feedback coming from digital display. Of course, there will be an instructor leading you through uphill climbs and sprints, and even getting off the bike to give you a little extra push if you need it. 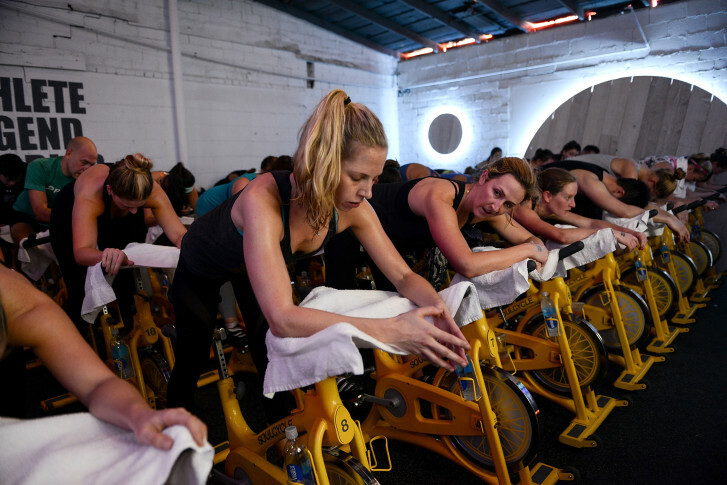 But the SoulCycle bikes, unlike the ones used at rival Flywheel, or even the ones you may find at your local gym, do not have displays that show you how much work you’re doing. If you do need this, you may be smart to invest in a heart-rate monitor you can wear in class. Ebenezer Samuel is the fitness director at Men’s Health and a CSCS-certified trainer. He said it’s important to vary your workouts and not rely on just one kind of gym class. Many of the instructors who lead boutique exercise classes such as solidcore, he said, are focused on moving their attendees from one exercise or bike/run interval to another, but may not be focused on a specific individual’s goals. But there’s definitely a place for a class like Flywheel or Corepower Yoga in your workout routine, Samuel said. Also, having a scheduled workout is always helpful for keeping up your fitness resolutions, especially if you have trouble getting your workout clothes on and getting out the door on a frigid morning, or need some inspiration in order to pass on a festive post-work drink with friends in favor of a gym session, he added. Many boutique classes fill up about a day ahead for peak-time sessions. If you book a class and don’t show up, you will usually forfeit that class from your package or be penalized the cost of the class if you’ve subscribed to an “unlimited” option. Keep an eye out for special holiday and New Year’s promotions that can significantly reduce the per-class cost. If you can’t choose just one gym class, or your fitness goals require yoga, cardio and the kind of heavy weightlifting you can only do at a traditional gym, the best option may be through an app called Classpass, which currently offers new subscribers the first month free. With Classpass, you purchase a certain number of credits per month, and every class or gym session you book costs a certain number of credits. You can even buy “gym time” and do your own workout a select local gyms. The best thing? Classpass has participating gyms and studios in most major cities. Keep in mind, however, that prime-time classes, such as a 5:30 p.m. solidcore session, are more expensive than the same class at an off-peak time. If you want to sample dozens of classes before making up your mind to buy a subscription, Classpass is the way to go. Number of locations in the D.C. area: Four in D.C. (14th Street, Mount Vernon, West End and Georgetown); one in Bethesda. Free intro class or discount? Yes, the D.C.-area studios have a discounted three-class/$60 promotion for new riders. But there are no free classes. Are the classes portable? Within D.C., yes, but you may have trouble using credits in studios outside of the area. Who is this class for? Someone who enjoys cycling and knows how to push themselves without relying on stats for motivation. Do you have to be in shape? No, but be ready for a sore backside from sitting on the saddle if you haven’t been cycling recently. Bring a water bottle. Do you need special gear? Shoes with cycling cleats make the workout more efficient. You can buy them on your own once you get into indoor cycling, or rent them at the studio. Shoes are free for your first class. Is there a learning curve? Yes, there is some choreography in the class. The instructor will tell you which position to get into (standing or sitting) and you should be prepared for some “tap-backs,” where you’re asked to touch your behind to the back of the saddle on cue. Shower: Most studios at least have well-equipped restrooms with soap, deodorant and more. Free intro class or discount: The first class is $15 but you can also buy a three-pack for $65. Are the classes portable? Yes. Who is this class for? Indoor cyclists who like statistics. The classes are all about feedback as you push for 45 minutes. Your stats are both on your bike, and on the Torq board (if you opt-in) for all to see. Do you have to be in shape? No, but like all cycling classes, you should expect some rear-end soreness after the first couple of classes. Do you need special gear? Padded cycling shorts are a good idea. The studios have cycling shoes available for free. Is there a learning curve? Not really. This class has some choreography, but it’s not the main focus. Pushing yourself really hard is. Showers? Yes. Both locations have a great shower and changing area. Towel service? Yes. One of the few studios you can count on for as many free towels as you need. Number of locations in the D.C. area: Four in D.C. (CityCenter, DuPont Circle, Georgetown and Glover Park. A new studio opens soon in Tenleytown); one in Bethesda (Md. ); five in Northern Virginia (Clarendon, Fairfax Corner, Falls Church, Merrifield and Pentagon City). Cost per class: $27 per class, $125 for a five-pack, $229 for 10, $429 for 20 (no expiration). For those who want more, a $165/month unlimited yoga membership is available (with a $89 incentive in the first month). Are the classes portable? Yes, if you buy a multi-pack of classes, you can go to any studio around the country and use them. Who is this class for? Yoga 1 provides a good workout for most of those who practice yoga. Corepower also offers more advanced classes, hot yoga, and YogaSculpt which includes weights. Do you have to be in shape? No, but as usual, it does help to have a certain fitness level. Do you need special gear? For all the yoga classes, a yoga mat is required. You can rent one at the studio. The first one is gratis. Bring your own towel, one for the class, and one for a post-sweat shower (especially after hot yoga!). Is there a learning curve? Some yoga experience is helpful. If you don’t already have yoga experience, it makes sense to progress from Yoga 1 to Yoga 2. Most people with a basic understanding of yoga, who are confident in a boot camp-style class will be comfortable with YogaSculpt right away. Shower? Yes, studios have showers and well-equipped changing rooms. Towel service? Yes, you can rent a towel for $2. Number of locations in the D.C. area: Six in Washington, four in Maryland, five in Virginia. Solidcore started in the Washington, D.C. Cost per class: Ten-class packs range from $270 to $330, monthly memberships, which include a set number of classes (4, 8, 12) or an unlimited number of classes, range from $125 to $399. You’ll be offered a special intro rate if you sign up for multiple classes on the spot after your initial class. Free intro class or discount? Two classes for $39, must be used within 60 days. Are the classes portable? You can use your classes at any studio with the D.C. area. Who is this class for? Someone who is in pretty good shape, but wants some help hitting body parts that don’t get challenged by traditional weight exercises such as squats and deadlifts, or endurance athletes who want to boost their core strength. Do you have to be in shape? It helps to have a good base of core strength and flexibility, otherwise you may find yourself taking a lot of breaks and not getting everything out of your hour. Do you need special gear? No, not even socks! Is there a learning curve? Yes, but if you have a good instructor, you will quickly be kept from feeling completely lost. Shower? No, but well-equipped bathrooms. Towel service? Yes. Plenty of free towels. Number of locations in the D.C. area: Dozens of locations from as far south as Stafford, Virginia, to as far north as Columbia, Maryland. Visit the locator for specific locations and search based on ZIP code. Cost per class: Memberships of four, eight or unlimited classes per month are available, as are multi-packs which average between $27-$30 per class depending on the number of classes purchased. Free intro class or discount: A free introductory class is available, but be ready for a pretty hard sell to buy a membership right after. Are the classes portable? Yes, you can book classes all around the country through Orangetheory’s app, but you will have to provide credit card information before you arrive to guarantee your spot if you’re coming from out of town. Who is this class for? Someone looking to sweat and get a full-body workout in one hour. Do you have to be in shape? It helps to have a good idea of basic weightlifting and rowing technique, and be comfortable working with very little guidance. You can choose to “power walk” instead of run on the treadmill, or use a stationary bike. Do you need special gear? Supportive running shoes are a must. You can also choose to purchase Orangetheory’s proprietary heart rate monitor, or rent one ahead of each class. These monitors will work with fitness apps on a smartphone, so you can use them for your own workouts, but other heart rate monitors do not connect to Orangetheory’s in-house system. Is there a learning curve? The first class can be a little disorienting, but once you get into the flow, it’s fairly straightforward. Shower: Most gyms have at least one shower, but it’s a good idea to call ahead to be sure. Also, bring your own towel, just to be safe that you’re not left dripping wet. Towel service: Most gyms do not have a towel service. Bring your own. Number of locations in the D.C. area: Five: Bethesda and Kentlands in Maryland; Mosaic District in Virginia and Logan Circle and Cathedral Commons in D.C. Cost per class: Varies, depending on location, from $17 off peak to $25. Free intro class or discount? Yes, one free class, and then new riders can get a three-class trial for $33. Are the classes portable? Yes, with some restrictions. Who is this class for? Someone who likes cycling, and music, and really needs a cheerleader/DJ. Do you have to be in shape? No more than any other cycling class. Do you need special gear? If you have cycling shoes, you should bring them. Otherwise the rental fee is $3 after the first class. Is there a learning curve? Not really, in the sense that most people know how to ride a bike. There is some choreography, however. Shower? Yes, they all have showers, but some locations are fancier than others. The Cathedral Commons location’s waiting area and shower area is top notch. Cost: Some are free, some are about $5 per month. Peloton bikes cost about $2,500 with an accessories package, but not including the monthly subscription. Are the classes portable? Anywhere you have a fully charged phone and bluetooth headset, you can do a workout. Aaptiv is great for a hotel gym or even a hotel room. Most group fitness classes now have a “to-go” option. Who is this for? Someone whose schedule is not conducive to attending group exercise classes or has limited time to get to a gym. Do you have to be in shape? These classes can get you in shape. There are many levels to choose from. For example, Aaptiv offers beginner, intermediate and advanced workouts in almost every category. Do you need special gear? It helps to have a yoga mat and some weights, but it’s not required. Shower? Yes, the shower at your house! Towel? Yes, the towel in your linen closet.